We have been awarded Trip Advisor's Certificate of Exellence! In the beautiful mountains of Western North Carolina there are many vacation homes, but there is nothing quite like the Yummy Mud Puddle. Nestled on ten acres amidst a tall forest, the Yummy Mud Puddle vacation home overlooks the rolling hills and valleys of Yancey County, roughly forty minutes from historic Asheville, known for its progressive live music, abundant galleries, and vibrant, eclectic nightlife. Also within a short drive is access to countless hiking trails, rafting and kayaking, fishing, the Blue Ridge Parkway, and famous Penland School of Crafts. This rustic rural region is distinguished by the unusually high number of craftspeople and artists who call this stunning territory home. During your time at the Yummy Mud Puddle vacation rental, you will be in the perfect location to experience the rich and varied culture of this decidedly artistic, yet unmistakably Southern community. Spacious enough for six, and versatile enough to accommodate couples, families, or singles, the Yummy Mud Puddle vacation house is the perfect fit for a quick getaway to the mountains or a longer retreat. Both the master and floral bedrooms have queen beds and walk-in closets as well as great views and access to the deck. The master bedroom features a private bath with a whirlpool bathtub and separate shower. The third bedroom is perfect for children or single adults with two twin beds, a walk-in closet, sublime jungle motif, and a private door into the bathroom. We now have fiber optic internet access with free local and long distance landline phones. Rates are posted for both weekly or nightly rentals. The house is warmed by central heat during the cooler months and cooled by ceiling fans in every room during the Summer. We are a pet friendly rental for well behaved dogs under 50 pounds who are up to date on all of their shots and flea treatments. The Yummy Mud Puddle is a family business, and we pride ourselves on providing everything you need while you relax and enjoy your mountain home away from home. All linens and towels are provided. The home is completely set up and ready for your arrival. We’ll leave the lights on for you if you’re arriving after dark. Visit their gallery, where you may purchase Claudia’s beautiful handmade stoneware and porcelain, John’s truly extremely mixed media sculptures, and Kathryn’s textile wearables. Feel free to wander the grounds, relax on the dock while feeding the fish, and observe the artists in their natural habitat. Claudia and John are friendly folks who love living here and know you will love visiting. Whether you need directions to the Biltmore Estate in Asheville or a recommendation for a local restaurant, they are happy to help. Claudia personally prepares the house for your arrival with clean linens and fresh flowers. 1. The Yummy Mud Puddle is a smoke free property. 2. The driveway to the rental is a circular so you don’t have to back down the drive to exit. A key for the house is located inside the duck next to the first door. This is a doorknob key only. We’ll leave the house unlocked for your arrival. Please lock the doors and place the key under the duck when you depart at the end of your stay. 3. Bring a flashlight. We leave the outside lights on for you, but there are no streetlights. We’ll also leave lights on inside so you're not walking into a dark house. 4. There are 3 bedrooms. 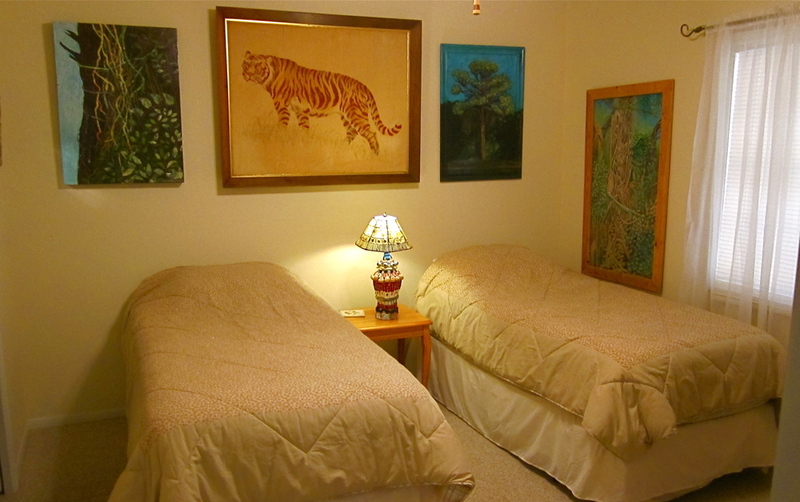 Two bedrooms have queen size beds and one has 2 twin beds. The master/mistress bedroom has an adjoining bath with a jacuzzi tub and a separate shower. There is a second full bath with a tub and shower. A queen sleep sofa is located in the living room. All linens and towels are provided. The kitchen is fully equipped. 5. The deck, which runs the length of the house, has a large table and chairs. A gas grill with a tank of gas is located in the storage room off of the deck for your use. Because there are many critters about, you’ll want to be sure to clear the deck of all food as it only encourages the raccoons and other critters to visit you. 6. There is a laundry area next to the kitchen with a washer and dryer. 7. Trash pick-up is Monday. Please place your trash in the plastic bags provided and put them in the large outdoor trash container under the overhang. We recycle at the Puddle and there are bins under the overhang for this purpose. We collect the trash for you. 8. This house has fiber optic service for the telephone, t.v., and internet provided by Country Cable at no additional charge to you. The password is 111555777 and is attached to the modem located in the floral bedroom. The tech support number is 877.802.0475 and is 24/7. 9. The phone number for the house is 828.682.9559. The phone has local and long distance service within the US at no charge. At this time, Verizon and US Cellular cell phones work best here. 11. If you visit in the Winter and we have snow, you may need 4 WD or AWD in order to access the house. 12. Check-in time is 3:00 pm and check-out is 11:00 am. 13. All pets must be up to date on their flea treatments and shots. Pets are not allowed on beds or furniture unless you have a protective cover. Please keep your pets with you or in their crate if you leave them in the house. 14. You’re welcome to feed the fish during the warm months around sunset at the dock located beside our home. Just let us know and we’ll make sure you have fish food. You are also welcome to visit our sculpture and pottery studios anytime we’re home.